Visits to wineyards in Montefalco! Contact us for more informations! 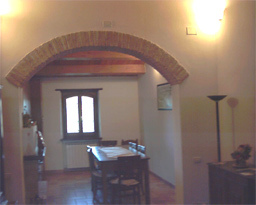 Our B&B is an old country house, over the green hills of Umbria. We have double rooms, with private bathroom, all equipped with TV, heating and air conditioning. Our breakfasts are prepared with natural ingredients of our land , according to our traditional recipes and will be served in our dining room. You will taste traditional home made sweets, which you can try with	the wine produced over the green hills of Montefalco. The price per nite in a double room, including breakfast starts from only 45 euros!